This species is accepted, and its native range is Peninsula Malaysia (Negri Sembilan). Negri Sembilan: known only from Bt. Senaling near Kuala Pilah. Solitary rattan climbing to 15 m. Stem without sheaths to 9 mm in diameter, with sheaths to 1.7 cm with internodes to 25 cm. All parts drying pale green or straw-coloured. Sheaths pale green covered with grey indumentum when young and with upward pointing black tipped spines, to 5 mm long. Knee present but not very conspicuous. Ocrea inconspicuous. Flagellum to 1.5 m long. Leaf ecirrate, to 1 m long, with a short petiole in juvenile state no petiole in adult. 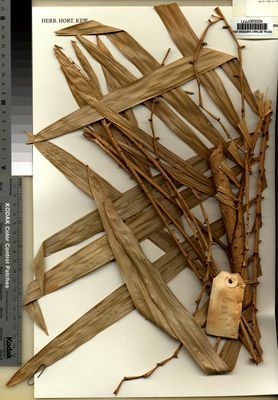 Leaflets about 15 on each side of the rachis, irregularly arranged in the juvenile, subregular in adult with lowermost 3-4 leaflets in adult swept back across the stem. Lowermost leaflet 10 cm long by 7 mm wide largest leaflets to 35 cm long by 2 cm wide, with heavily thickened margins, and moderately conspicuous lateral veins; leaflets ± unarmed. Inflorescence only old female known to 1.5 m long with 4 partial inflorescences to longest to 25 cm long. Inflorescence bracts shortly armed with reflexed spines; rachillae reflexed, curved, about 6.5 cm long bearing rather distant flower scars. Bracteoles unarmed. Flowers and fruit unknown.